Wave ‘farms’ to generate power Tidal energy is a form of hydropower that converts the energy of tides into useful forms of power - mainly electricity. 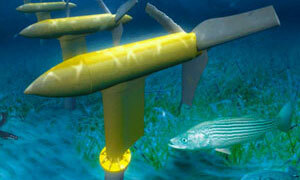 The tidal energy, is generally known as the tidal power. 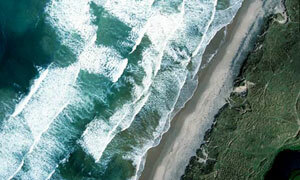 We can capture the power of ocean currents and cultivate it to generate electricity. Kinetic energy system: This type of energy system extracts the energy from the moving water of rivers, tides and open ocean currents. Potential energy system: This type of energy system extracts the energy from high and low tides using their difference in their heights. Kinetic energy system has become popular as it does less harm when compared to the damage caused due to dams and barrages. People are looking for more coastal areas for the production of electricity using the tidal energy. A renewable source of energy. Tidal power generates electricity by capturing the energy contained in moving water caused by tides. As this phenomenon is natural, tidal energy is renewable. The tidal power can be viewed as renewable source of energy because we don&apos;t use up the resource while converting it to electricity. The main source of this energy is the orbital kinetic energy of the earth–moon system, and that of the earth–sun system. The tidal power has a good potential to generate electricity in the coming years. It is inexhaustible and can be reliable. Tide of water rotating a turbine Tidal power has great potential in future for electricity generation because of the massive size of the oceans. Tidal energy is the utilization of the Sun&apos;s and the Moon's gravitational pull on the water here on Earth. Our seas and oceans contain a great amount of energy as they come crashing to our shorelines. 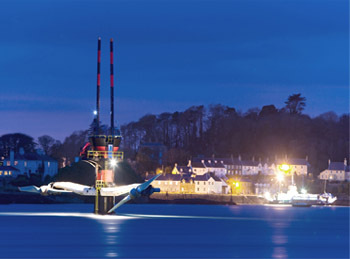 Tidal energy comes from harnessing this energy into a useful type of energy, generally as electrical energy. Tidal energy traditionally involves erecting a dam across the opening to a tidal basin. The dam includes a sluice that is opened to allow the tide to flow into the basin; the sluice is then closed, and the only way the water could escape as the tide fell was by passing through and propelling a waterwheel, so providing turning power. As the tide comes in, it is allowed to build up against the dam until there is a difference of 5 feet between one side and the other. Then it is allowed to pass through the turbines, driving them and generating electricity. When the tide begins to fall, the turbine blades are reversed, and the water generates electricity again. The amount of electricity generated depends on the ‘head’ of water – the difference in the level of the water between one side of the dam and the other. The larger the head, the greater the amount of electricity that will be generated, because the water is under great pressure and so turns the turbines with more force. The next five years are critical for tidal energy devices to prove both technical and economic viability of the technology. Diurnal and semi-diurnal tides Tides on Earth are influenced not only by the phase of the moon, but also by the "latitude" of the moon - or where the moon is in space compared to Earth. Tides are caused due to the interaction of the gravitational fields between the Sun, Moon and the Earth. This tidal energy conservation which is developing now–a–days tries to exploit the raise and fall of the ocean levels due to the gravitational field of the planetary system. The tides have two main periods. (i)Diurnal: This type of tides occur at about once in 24 hours. They can be observed as a single high and a single low tide that occur each day. They tend to occur in certain areas when the moon is at its furthest from the equator(in terms of space time). (ii)Semi-diurnal: This type of tides occur at about every 12 hours 25 min a day. They can be observed as two high and two low waters that occur daily and are relatively of similar ranges. This type is more prevalent when the moon is over the equator. During the year, the motion could be influenced by the positions of the three planets with respect to each other. Normally, the Spring tides occur when the tide–generating forces of the Sun and the Moon act in the same direction. If we consider the lunar tide which is superimposed on to the solar tide then the tides may range up to 17 meters. If the tide generating forces of sun and moon act perpendicular to each other then Neap tides occur. One needs to distinguish between the potential energy and kinetic energy of the tide as the vertical water movements of raising and falling tides are associated with the horizontal water tidal currents. A tidal power plant Tidal power generates electricity by capturing the energy contained in moving water caused by tides. The technology used in hydro-electric power plants stands as a motivation for the technology required for converting tidal energy in to electricity. The first requirement is a dam across a bay of a vast ocean or an estuary. At several points along the dam, turbines are installed which will generate electricity. The hydro–static head is the one that plays a key role to make the water flow through the turbines and thereby turning an electric generator to produce electricity. Due to corrosive effects of sea water a fully submerged device must have a non-corrosive layer which helps in staying under salty solutions for more time. Hence the construction costs will go high to make a non-corrosive device which stands still in any harsh corrosive conditions. 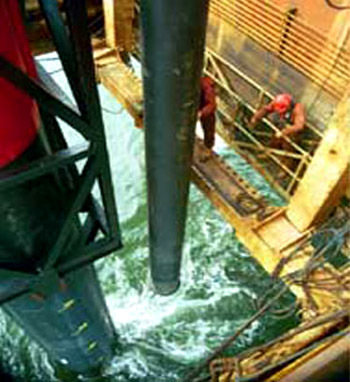 The maintenance of the submerged devices is a bit difficult task as the sea-divers are needed to access submerged machinery when ever it runs in to trouble. Based on the local conditions of the tides one can predict the availability of tidal currents accurately when compared to the atmospheric air flows for the wind turbines. As we know that the density of water is more than air, the power intensity of oceanic currents will be more than the traditional air flows. Hence we can have a smaller water current turbine than an equivalent powered wind turbine.